Kitchen stool features a padded seat and back for added comfort. Made with chrome-plated steel for an attractive, durable finish. Comes with removable arm supports for added safety and comfort. 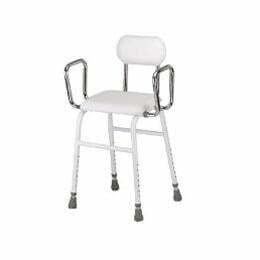 Easily assembled and adjustable height to accommodate most size individuals.